From left: Dr. James Thompson; President-elect Dr. Phillip Nelson; President Dr. Douglas Freeman; Immediate Past-President Dr. Eleanor Green; Treasurer Dr. Mark Markel; Dr. Calvin Johnson; Dr. Robert Dysko. 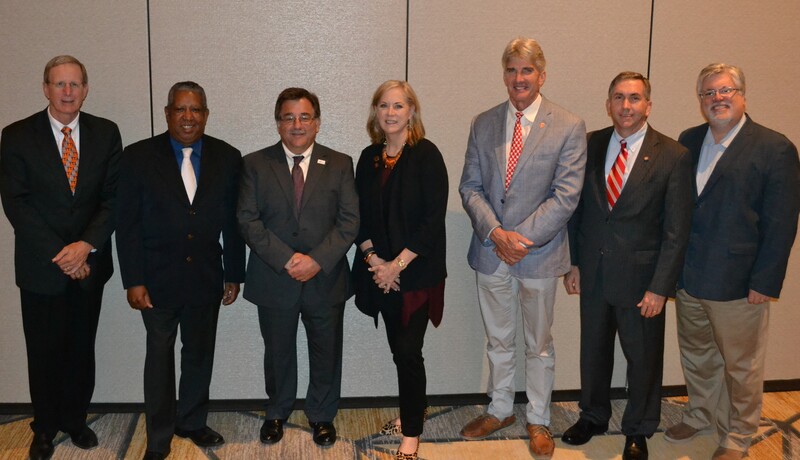 Members of the Assembly of the Association of American Veterinary Medical Colleges (AAVMC) elected new officers and considered several topics and initiatives in academic veterinary medicine during the 2016 AAVMC Assembly on Monday, August 8 in San Antonio, Texas. Dean Johnson was elected to represent at-large District I. The Assembly also heard summaries of key issues that were examined during in-depth sessions featured as part of the summer meeting of the Board of Directors on August 7. The AAVMC is a nonprofit membership organization working to protect and improve the health and welfare of animals, people and the environment around the world by advancing academic veterinary medicine. Members include 49 accredited veterinary medical colleges in the United States, Canada, Europe and Australia.